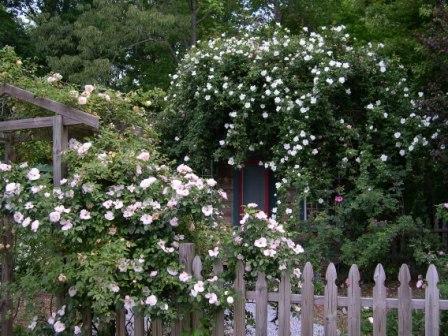 Roses drape a building and arbor in my no spray garden in the upstate of South Carolina. We realize a section dedicated to a rose’s first year may seem a little silly but bear with us. As with any living thing getting your rose off to a good start is going to save you so much hassle down the road. So please take a moment to view the video as it is a much easier way to explain to you what we are talking about. Before you do so, we hope these 6 simple parts give you confidence to try roses either for the first time, or to try them again. Roses are incredibly diverse and rewarding garden plants and with some thought, your gardener’s instincts and a healthy dose of common sense they will reward you for years and years. Welcome To Our Rose Family! Feel free to let us know anything else you’d like to see us talk about!